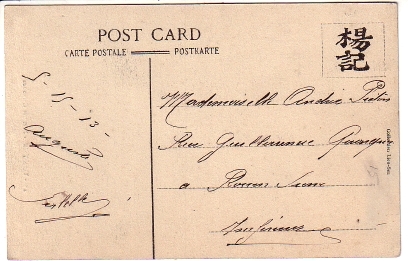 Message: The figures above the signature are probably not a date but an encoded message. 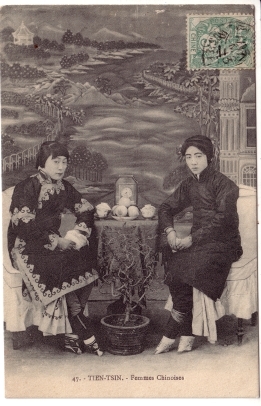 Action: Two young women seat on Western chairs with covers, on either side of a round table with clock, tea cups and plate of peaches, with a potted tree between them. The painted backdrop shows a fantasy Chinese landscape. Both hair and fashion, with tight leggings and high collars, date the image about 1910. Image Particulars: This is north China, either Tianjin or Beijing.